Gadgets are small specialised applications that resides on your desktop for quick user access. While they have been around for a while, they have become mainstream with their introduction in both Mac OSX and Windows Vista. The common types provide weather information, RSS feeds, currency calculations or act as calendars, stickynotes, clocks, computer performance meters and more. If your site provide information to many people you might want to consider offering a gadget to provide information directly to your user's desktop. 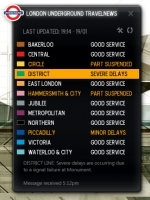 I created a gadget which pulled live travel news from TFL's website and displayed it in a short list illustrating each line's status.